Following on from last week’s article about air cooled heating, let’s get on with adjusting it. Get the vehicle far enough and safely enough in the air that you can crawl underneath and still safely operate tools. Disconnect the battery. This is optional but safe. Take ALL of the tools with you otherwise you end up doing a lot of sit ups going to fetch the above items. Between the rear wheels at the back of the Y shaped J tube and heading into the heat exchangers, you will see two flaps, one on either side. These control the hot air coming forwards from the engine into the J tube and up to the front of the vehicle. If required, have your friend sit in the front and move the red levers up and down – look for movement underneath! When both levers are moving, you should see a thin metal cable moving a flap that is about 50mm long and there should be a spring and a bolt. The arm should be moving freely forwards and backwards. Most commonly the cable is either missing or jammed. If the cable is missing, get a new set! If the cable is jammed, get some lubricant on it and try again later. Manually move the bolt using pliers and see if the cable is free but the bolt is jammed. If required, detach the cable and verify which piece is jammed. Once all is moving, check that the control arm is as far forward as it can go when the cable has the slack taken up and the level on the dash is fully open. Similarly the level at the other extreme on the dashboard should allow the bolt to fully close the flap. Adjust the slack on the cable using the 6mm spanner / socket, release the bolt, use pliers to take up the tension and tighten again. This actually needs doing regularly. Thank your friend kindly and let them get on with something less interesting than fixing the heating on your vehicle. As you are under there, don’t forget to wire brush and the loose dirt, muck and other unwanted bits then paint and underseal, especially on the heating pipes. Follow all along from the front of the heat exchangers, along the J tube, the main tube in the middle, up and over the beam and up to the totem pole. Look for holes, leaks and missing insulation. Fix them all. Crawl out from under the vehicle, stretch, curse if required, dust yourself down, get the axle stands off, reconnect the battery and celebrate by moving the levers on the dash of your working heating. Remove the socks from the air vents on the dash (a popular way of stopping the draughts in the 90s), start the engine and feel more heat than before. If it is still not HOT once the engine is up to temperature then you still have air leaks in between the heat exchangers and the cab. Troubleshoot every join, seal every incorrect hole and check every flap. Come along to a club meeting and we can all take a look together! This entry was posted in Public, T1, T2, T25 on 19/04/2019 by Nick Gillott. This article will help those with an air cooled vehicle from a Split screen through to the early T25. If you bought a water cooled engine, then it does not apply! Do you own a VW that you cannot use in colder weather without travelling in a big coat, bobble hat, thick socks and blue fingers? It is a great and effective system but with 39 years since they stopped producing the late Bay and nearly 60 years since the introduction of the Split screen, inevitably there will have been a small amount of wear and tear. In this article, we are going to cover some of the important parts of getting some of the lovely heat from the engine up to the people at the front. That’s you. The engine produces heat and a lot of it goes out of the exhaust system. Part of that exhaust system is the “heat exchangers” and that literally means a sleeve around part of the exhaust pipe that heats up the outside air. Once that air is warm it can warm you but it is currently underneath the engine at the back of the vehicle. We need to move it from there up to you without losing much of it. The big fan above the engine cools the engine (air cooled – the clue is in the name) and there are two big ducts / funnels, one of either side in the engine bay. These go through the metal tray around the engine, underneath, into the heat exchangers and can then enter the heating system. From there, a control flap can be opened to funnel that heat along a 90mm / nearly 4 inch tube along the middle of the vehicle from the gearbox up to the front wheel line. From there is jumps over the front beam in a squashed tube then turns up at the front at the totem pole for those of you with that funny looking piece of metal. If you can get heat into the van, you want to keep it there. Windows need to be able to close fully, doors need to close with no draughts, door seals need to be good. Any original flaps, sliders and other ways of getting air into the van need to be able to seal, otherwise that good, warm air will leave very rapidly. these are all visible and easy to track down. Make sure that the roof has similarly no big holes for heat to leave. Now focus on the insulation. If you have zero insulation in the walls, the heat is going to leave really quickly – not only when you are travelling along but also in the evenings when you are sitting quietly, drinking wine and playing scrabble. Other excitement is available. Remove the wall panels and insulate – that is an article for another day, just don’t use rockwool which absorbs moisture in something that you squash into cavities pressed against metal bodywork. You may as well just drop the whole vehicle in the sea and let the salt water rust your pride and joy! For evenings, consider curtains which will help insulate too. That big doghouse fan noted above. Does it turn freely, helping to cool your engine? Ensure all is good in there otherwise you will have a hot engine and cold passengers. From there on both sides are holes about 3 inches / 70mm diameter – check they are not rusted and letting out that precious heat. From there, they warm air goes into stretchy concertina plastic tubes that pass through the tin tray around the engine and underneath. These should be tightly attached to the fan at the top using good jubilee clips – these are inexpensive and will really help. Now get under the vehicle, safely (disconnect the battery, use axle stands, tie back long hair and loose clothing, your health and safety officer should be standing by and so on). At the bottom of those two concertina tubes they should connect to the heat exchangers, these are boxes on either side of the engine forming part of the exhaust system and do not touch them if the engine is warm. Again, the connection from one to the other should be free or rust, rot and holes and should be sealed well by the jubilee clips. The air from the engine has now flowed underneath the vehicle and has been pushed past the exhaust, getting hot. Both heat exchangers flow the air into a Y shaped tube, curiously called a J tube, although replacement parts may mean this works slightly differently. From there, that lovely hot air enters the tube running along the middle of the vehicle. Once again, the join from the J tube or similar into the middle heating pipe needs to be sealed and not allowing the air out. That big tube running along the middle of the vehicle needs to be free from holes. Originally from the factory, it is a heavy steel pipe with a jacket around it. that jacket is often missing or otherwise less than perfect. Check it, refit it, replace it. Even a heavy coat of underseal will give you some thermal help as well as reducing the air loss due to holes. Just in front of the B posts (between the front doors and the sliding door) that tube joins a flattened pip section that jumps over the front beam and up to the front of the vehicle. That can have holes and is tricky to fix. From there you are almost up into the cab area and once inside, there are usually few issues. The levers on the dashboard that are red are for the warm air. The green or blue ones are for the cool air. Next week, see how to get the red ones operating as they were designed. This entry was posted in Public, T1, T2, T25 on 12/04/2019 by Nick Gillott. 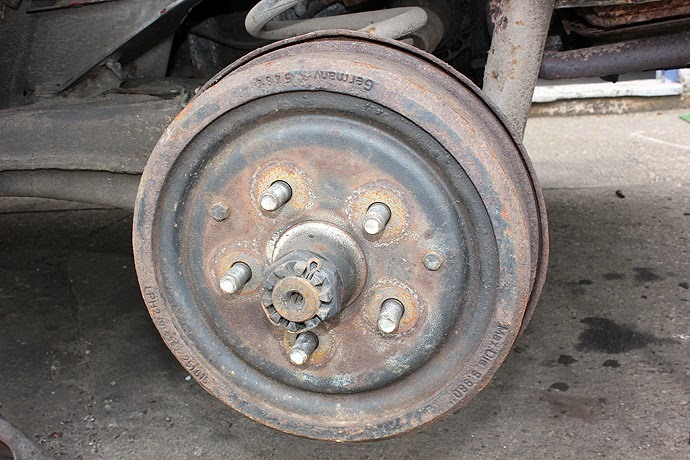 Following on from last week’s post about brake shoes and drums, this week is about hydraulics. They sound scary, but are less so once you know a little about it. The brake cylinder is the….erm….cylinder at the top. Is it leaking or otherwise not in good shape? It is bolted through the back of the hub with a 13mm bolt. Inspect the hose as well, they need replacing after a while, especially if you see any lumps, bumps, bulges or splits. These are replaced by undoing the 11mm nuts, remembering that you will need to plug the rest of the system to stop all of the brake fluid from dropping on the floor and that stuff is slippery. I normally use a plastic golf tee pushed into the hole then cling film / food wrap over that and the pipe / bracket and some insulation tape to hold it all in place. You won’t keep the air out totally and will need to bleed the brakes at the end. If you change the cylinder, it attaches with that same bolt. If you change the brake pipe, just do up the nuts. Paint the metal, copper grease / anti-seize anything that isn’t the drum and shoe and reassemble as noted in last week’s article (link is at the top of this one). The more attention you spend now on greasing and anti-seizing the nuts, bolts, holes, springs and so on is going to save time in the future, let it all last a lot longer and reduce the chances of problems. Don’t forget to do the other rear wheel too! This entry was posted in Public, T1, T2, T25 on 05/04/2019 by Nick Gillott. Hello everyone, the date coincided with a well known event, so today’s post had to be about brakes. There is not much humour writing a weekly post about maintaining a vehicle! As we start the 2019 season in the UK, you need to think about the important things for your vehicle. Engine, fuel, ventilation, warmth, power, torque. They are all irrelevant – if you cannot STOP, that’s the only important thing you need to ensure is working! 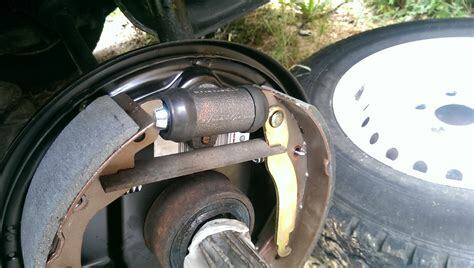 Today’s post is about the REAR original brakes on a split screen, Bay window and T25. 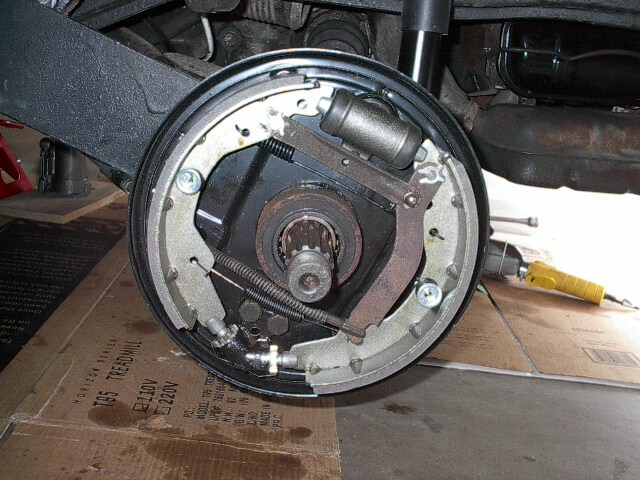 These are drum brakes and the principle is similar across all manufacturers and we are going to look only at the shoes in this article. Hubcap removal tool if you have standard steel wheels. You can improvise with a thick wire coat hanger! Put the vehicle in gear and let the clutch out so that the vehicle isn’t going anywhere and the wheels will not turn. Remove the rear hub caps using the removal tool or a coat hanger suitably shaped to fit into the two little holes on the side. As you yank, keep your feet against the tyre as a hubcap catching device otherwise you will scratch the expensive and shiny cap! I find either gloves or a screwdriver to go around the removal tool makes the job much easier, so I am pulling the screwdriver not the thin bit of metal. Loosen the wheel nuts on the two rear wheels by half a turn as it makes things far easier. Then jack up the back of the vehicle using the rear beam (the big thick tube between the rear wheels) high enough to get axle stands under that beam. Let the vehicle down onto the axle stands slowly and safely. Ensure that nothing is loose, about to fall over or anything else that could impact your safety. Now remove all of the wheel nuts and put the two rear wheels somewhere safe. Under the vehicle is usually a popular place. Crawl underneath the FRONT of the vehicle and start heading backwards. Towards the rear of the cab section you will see the handbrake cable coming from the front and there is a mechanism that has a cable from there to each of the rear wheels. Slacken off the bolts here to loosen the handbrake cables – you will need to adjust the handbrake anyway and the handbrake if often the reason you cannot continue and get the hub off. the bolts that you need are square and 11mm but could have rusted, take options on the tools required! Now sit in front of one of the rear drums. There is a backing plate, understandably at the back of the circular drum. At the back of that are the adjustment screws – loosen them with a screwdriver once you expose them by carefully removing the rubber bungs. Get those bungs out, inspect them for damage and put them somewhere safe. If you pried them out, look for damage as they harden with age and may need replacing. If you got the bung out and there is no screw behind it, you took out the optional lining inspection bung. Two bungs – adjustment, four bungs – only remove the bottom two. The screws go ANTI clockwise to loosen. They rust, so be prepared for both swearing and replacement. Now that you have removed the bulk of the tension from the parts inside the drum, let us have the first attempt at removing the drum. There are 2 11mm bolts, they may also be rather stiff but a decent socket will normally get them off. Once those two are off, the only thing holding the drum on is rust and anything inside that should have moved and did not. Grab the drum firmly and pull. Heave. Have another go. Wiggle it, wobble it but keep it at the same parallel angle or you can jam it. If it does not move, and if it hasn’t been off in years that is likely, hit it with a hammer – either a “dead blow” hammer or a piece of wood and a big hammer. A mallet just isn’t enough. If you still cannot remove, start adding penetrating oil and more of the hammer until it all gives. With the drum off, review the state of your knuckles and measure the inside of the drum circle with a tape measure. As you move around, if it exceeds 253mm diameter, replace the drum. Also check it is consistent as a variation here is what causes the shuddering braking where it is on/off which is inefficient, dangerous and disconcerting. Now look at the “shoes”, the curved pieces on either side of the middle. The outside of the curve is the brake pad, there should be 6mm on a new pad and 2.5mm is the minimum point where you need to change them. Remove the handbrake cable, remove the spring holding the shoes together, pull the shoes apart and remove them – you WILL get dirty. If you have anything else in there like springs, separating bars or anything else, get a picture before, during and after to be safe. With everything disassembled, clean it all and replace anything worn to the limit or rusty. You can buy the drum kit (no, not annoyingly noisy music gear) quite cheaply from a motor factor or your chosen VW stockist and some of the parts in the kit may not be needed, don’t worry about leftovers! If you want to tackle more, don’t reassemble things, read next week’s article. Understandably, reassembling is the opposite exactly. Put the new or cleaned parts back in reverse order. Tighten the bolts and adjusters down so that the shoe just about touches the drum. Make sure that from the original you have nothing left over, everything has been copper greased on all bolts and that no grease is on the shoe or drum. I quite like to sand the outside of the drum and paint it but it is never seen and not overly expensive to replace, but everyone is different. Once the drum is back together fully and adjusted in situ, tighten the handbrake cable such that you can turn the drum with no handbrake but you have minimal travel on the handbrake lever to stop the wheels turning. That can take a few goes! Jack the vehicle up, get the wheels on, add the wheel nuts, tighten them, let the vehicle down and torque up the nuts. Test the brakes fully and feel proud. You did that. This entry was posted in Public, T1, T2, T25 on 29/03/2019 by Nick Gillott. Many of us suffer from that indistinct, rather sloppy gear change. In fact, fixing it is a bit time consuming and will make you a bit oily but is not as tricky as you might think. This video is for a VW Beetle but a split screen, early Bay, late Bay, type 25 and type 3 all have a similar mechanism. Buy the right parts, have a wire brush and some degreaser like Gunk handy and it can transform you gear changes! This entry was posted in Public, T1, T2, T25 on 22/03/2019 by Nick Gillott. The bus at “Mano de Desierto,” a large sculpture of a hand in Chile’s Atacama Desert. High School at the same time. Big school, different classes, different crowds. “We just got the idea that we wanted to do some long-term travel,” said Vought. what can only be described as an extended leave of absence. adventure, the bus didn’t go anywhere as they rebuilt it. the horrible orange paint to a classic green and white two-tone. America, surfing and camping on beaches as they went. continued into the Andes, traveling through Ecuador, Peru, Bolivia and Chile. are already contemplating their return to home and jobs. can make our money last,” she said. reasons for making the trip. answer is always no. “It’s our baby!” said Ely. This entry was posted in Public, Stories, T2 on 01/02/2019 by vwt2ocadmin. Following on from our recent post about the id Buzz http://vwt2oc.co/wp/2018/10/26/the-id-buzz/ did you know that is not the first electric vehicle from Volkswagen based on the classic type 2 chassis? Ah, but did you also know this original version was a little older? Back in 1970, Adolf Kalberlah was there looking at alternative methods of power and VW made a type 2 T2 Bay window with a top speed of 43mph and a range of 43 miles. That is about 7 times the range of some of the current crop of electric vehicles and this was 48 years ago. This entry was posted in Public, Stories, T2 on 14/12/2018 by Nick Gillott. For those of you that prefer more reading, here is some great information on things to watch out for when buying a Bay Window. Put your feet up in your preferred Volkswagen and read about buying the iconic 1970s vehicle. This entry was posted in Public, T2 on 31/08/2018 by Nick Gillott. 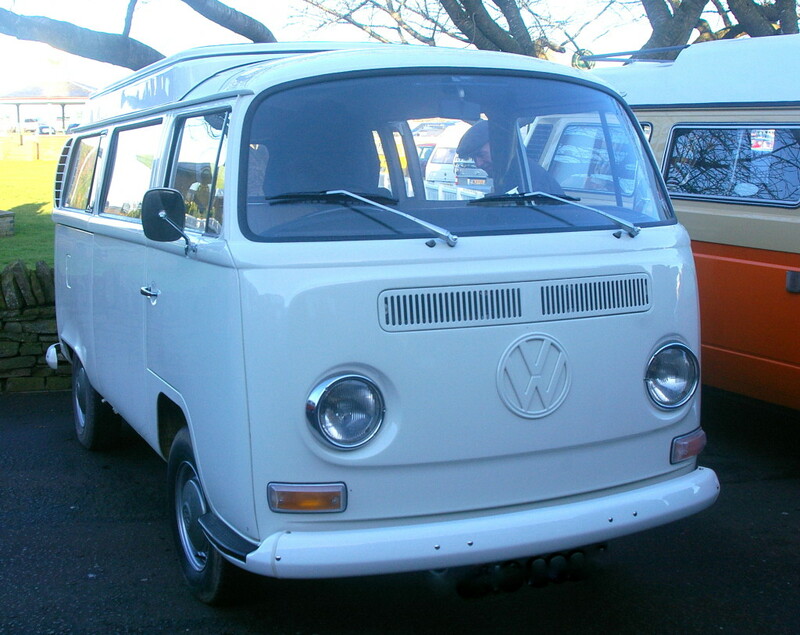 After the iconic split screen had been produced for more than a decade, VW introduced the “Bay window” in 1968. Special Patrol Group member Mike carefully restored Spookie the 1972 crossover Bay over 20 years ago and carefully documented each section of the rebuild. Hand drawn specific details have proved very useful to amateur restorers ever since and the film based photographs are there for posterity. Mike owned and ran Spookie for 18 years with no issues during that time before selling him a few years ago. A great story of rebuilding when parts were scarce and documentation was minimal and an inspiration to us all. Anyone know the current owner? This entry was posted in Public, T2 on 24/08/2018 by Nick Gillott. Orders of The VW T2 Skyrocket. The Volkswagen T2 is one of the most iconic campervans in the world. Its popularity and evergreen design has endured for over half a century with over 10 million having been produced. Caravan Owners Club recently reported that production of this incredibly popular vehicle will finally come to an end on 31st December this year. Despite still being one of Volkswagen’s most successful products, with output being presold even today, health and safety laws being introduced in Brazil mean that the vehicle’s lack of airbags and ABS system will signal the end of production at the VW plant in Anchieta. Despite this rather gloomy news there has been a silver lining for campervan conversion company Danbury Motorcaravans, who have seen orders for converted T2’s skyrocket since the end of the Type 2 was announced. “We are absolutely inundated,” Jason Jones, sales manager at Danbury told Caravan Owners Club. “People who have thought about buying a T2 but have maybe put it off, now have a limited time in which to order one, because on the 31st December production will stop forever. Although those who want to capture the symbolic freedom that the type 2 represents may be disappointed if they do miss out, it’s not all bad news as there are other high quality campervans available as an alternative, like Danburys T5, VW Caddy, or Fiat Doblo conversions. Danbury’s new double back T5 campervan comes with an unprecedented choice of 10 different wood finishes, 5 different flooring options, and 150 types of fabric and leather finishes meaning that each one is different and is really a bespoke design depending on the preference of the consumer. So while the 31st December will mark the end of the road for one of the most popular campervans ever produced, you do have a last chance in which to order one if you act quickly. This entry was posted in News, T2 on 18/11/2013 by vwt2ocadmin.